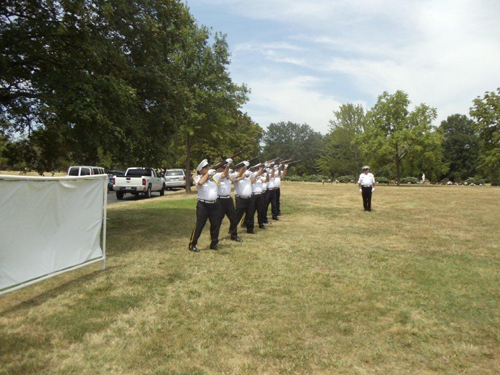 Shown here is the MOSSAR Color Guard Team, who presented the National Colors on Saturday, July 21, 2012 at the Veteran's and First Resonder's Memorial, which was held at Mount Olivet - Legacy Gardens, Mount Olivet Cemetery, Blue Ridge Blvd, Kansas City, MO. 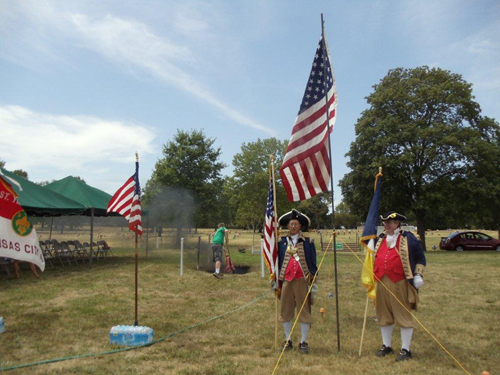 The Home of the Veteran's and First Resonder's Memorial was held at 2:00 pm on July 21, 2012. The Memorial was conducted by the American Legion Post 189 of Lee's Summit, MO, in which there was a 21 gun salute. Also paticipating, the local tropp from the Boys Scouts also presented flags. In additon, this is first annual Dignified Disposal of Unserviceable Flags. Left Photo (L-R): American Legion Post 189 Firing Team of Lee's Summit, MO. Right Photo (L-R): Major General Robert L. Grover, MOSSAR Color Guard Commander; and Compatriot James L. Scott, Western Color Guard Commander.